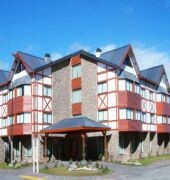 The hotel is situated close to Lake Argentino and surrounded by woods and mountains, this 4-star hotel in Calafate provides cosy, well-equipped rooms and a restaurant serving local cuisine.Your day at Tremun Calafate Parque Hotel begins with a rich breakfast buffet, which is included in the room rate. Later in the day, choose from a wide range of regional dishes and Argentinean wines in the hotel welcoming restaurant.Surf the internet for free in the hotel lobby, either using the Wi-Fi or the high-speed internet via cable. You will also find a selection of local handicrafts for sale here.Explore the attractive Patagonian village of Calafate on foot from Tremun Parque Hotel. This is the perfect starting point for trips to Lake Argentino and visits to the many glaciers nearby.